Sea Scouting had its beginning at a camp fire in England when Lord Baden-Powell voiced the hope that older Scouts would be interested in learning about boat management and seamanship. He stressed the need for young men to prepare themselves for service on their country’s ships. 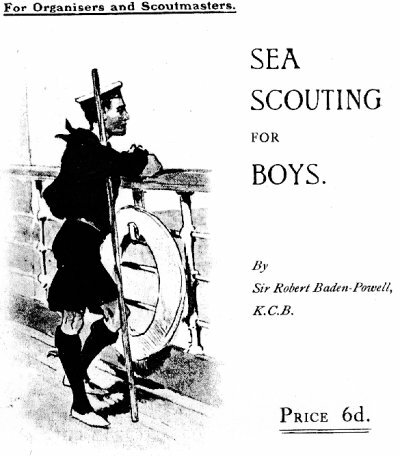 Following the campfire, there was activity in England that resulted in Lord Baden-Powell’s older brother, Warington, writing a book called Sea Scouting and Seamanship for Boys. It was enthusiastically received by the young men of Britain and soon found its way to the United States. Sea Scouting in America was founded in 1912. That year, Arthur A. Carey of Waltham, Massachusetts, had Sea Scouts using the schooner Pioneer and was appointed Chairman of the National Council Committee on Sea Scouting. That summer, Charles T. Longstreth organized a Sea Scout patrol on his yacht in Philadelphia. Both of these men prepared pamphlets on Sea Scouting and Carey’s Cruising for Sea Scouts was the first literature related to Sea Scouting. A booklet that preceded the first Sea Scout manual published in 1915 gave some direction to Sea Scouting. It was entitled Nautical Scouting and was compiled by Charles Longstreth. Since its beginning, the Boy Scouts of America had been aware of the need for an older-boy program. Mr. Carey made the first real effort to satisfy that need when he helped promote Sea Scouting with his pamphlet. In a report to the National Executive Board, Mr. Carey recommended that Sea Scouting be recognized as a special department of the Boy Scouts of America. He suggested that the pamphlet Cruising for Sea Scouts be accepted as a supplement to the Handbook for Boys until a more complete Sea Scout manual could be written. From 1912 to 1917, Sea Scouting struggled through a difficult period. And yet, with little or no national guidance, it managed to grow. In addition, G. V. L. Meyer, Secretary of the Navy, in February 1913, encouraged the development of Sea Scouting and extended the cooperation of the Navy Department. This was the beginning of a fruitful period of cooperation for Sea Scouting with the nation’s armed services. Sea Scouting received a real boost in October 1917, when James Austin Wilder (a veteran sailor, global traveler, artist, and devoted Boy Scout volunteer) was secured as Director of the Department of Sea Scouting of the Boy Scouts of America. For several years, as a volunteer, Mr. Wilder worked full time for Sea Scouting with the title of Chief Sea Scout. He organized the scattered Sea Scout units info a national organization that generated the first wide-spread interest in Sea Scouting. Gathering all of the experience and scattered bits of literature used in the program, Mr. Wilder supervised the preparation of the first Sea Scout Manual in 1919. In those days, Sea Scouting followed a pattern of action that was very similar to that of a Boy Scout troop; for example: boys wore khaki uniforms. In order to register, they had to subscribe to the Scout Oath and law and pass the Tenderfoot requirements. Membership required that a boy be 15 years of age and weigh at least 112 pounds. For many years the Sea Scout program was aimed at older boys who had graduated from Boy Scout troops. Sea Scout units began to be called ships. The age-old organization of skippers, mates, boatswains, coxswains and crews began to be used. 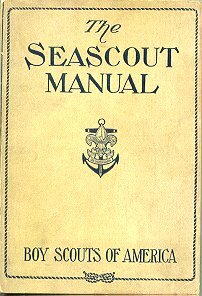 On July 15, 1920, the well-illustrated fourth edition of the Sea Scout Manual was printed and sold in large quantities. Then came a period of 2 or 3 years in which Sea Scouting struggled to be recognized and understood. Although membership fell off, the program proved healthy enough to withstand this period of adjustment. Finally it began to grow as more councils gave it enthusiastic support. Over the years, one of the persons most responsible for the development of Sea Scouting was Commander Thomas J. Keane. Between 1922 and 1925, he completely revised the Sea Scout program. He wrote the new requirements for advancement and changed the Boy Scout nature of Sea Scout uniforms into the seagoing uniform that Sea Scouts still wear today. As a result of his fine leadership, the Sea Scout Manual was almost completely revised. Under his direction, it was published in 1924. Commander Keane served as acting director of the Sea Scout department in the national office from 1923 until January 15, 1927. His annual report of 1925 indicates that there were 85 registered Sea Scout ships. A similar report in 1926 revealed an increase of 38 ships for a total of 123 ships. In 1927, Commander Keane was appointed the national director of Sea Scouting, its first full-time professional director. One of T.J. Keane’s earliest project was organizing the first Antarctic expedition to include a Scout. The Scout, Eagle Scout and Able Sea Scout Paul Siple of Erie Pennsylvania, ably participated in Admiral Robert Byrd’s expedition of 1928-29. In the years the followed, Siple built a career on Antarctic exploration and extreme cold weather climatology. In the years that followed, there was a marked increase in the number of units and boys registered in Sea Scouting. By 1930 the membership had reached 8,043 young men. In the 1930’s, with the cooperation of other departments in the national office of the Boy Scouts of America, he developed training courses for leaders, new registration procedures, and more acceptable Sea Scout equipment and uniforms. He also developed a National Sea Scout flagship competition in 1928 which has been in use in varying forms up to today. A major revision of the manual was made in 1939 by the national committee. The new version was written by Carl D. Lane, an outstanding skipper and author of many books and articles about small ships and the sea. With a membership of more than 27,000, Sea Scouting served its country well in World War II. Commander Keane was recalled to active service in the Navy and resigned his position as national director of Sea Scouting. Thousands upon thousands of former and active Sea Scouts joined the Navy and made a tremendous impression on Admiral Chester Nimitz, who sincerely believed that Sea Scouts were better trained and better equipped to help the Navy win out over the enemy and the elements. Throughout the rest of the 1940’s, Sea Scouting continued to serve the boys of America who were interested in the lore of the sea. Sea Scouts all over the nation participated in flood relief and community service. They were in evidence at national jamborees. 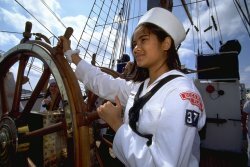 Sea Scout ships across the country held competitive events known as rendezvous and regattas. Based on the written report of ship activities-the ship log – a national committee selected the ship with the most outstanding record to be the national flagship. Quite surprisingly, two years this honor was achieved by a Sea Scout ship located in the rather arid state of Kansas. Its Skipper was Dr. William C. Menninger, one of the early greats in Sea Scouting. In May 1949, the National Executive Board made sweeping changes in the older-boy program, as a result of a study made by the Research Service of the Boy Scouts of America. This revision of Senior Scouting recognized as Explorers all young men who were 14 years of age or older and registered with the Boy Scouts of America. So, on September 1, 1949, the Sea Scouts officially became Sea Explorers. This was primarily a change in terminology since the old Sea Scout program continued much the same is it had in the past. In 1954, the National Executive Board of the Boy Scouts of America authorized the Research Institute for Social Service of the University of Michigan to make a national study of adolescent boys. This survey revealed the needs, desires, and concerns of 14- to 16- year old boys across the nation. As a result, a completely new Explorer program was developed and put into effect on January 1, 1959. However, this did not bring about a change in Sea Exploring. It was decided that changes should be postponed until there had been sufficient time to observe Sea Exploring in operation alongside the new Explorer program. After 5 years, in which there was ample time to make such observations, the decision was made to revise the program. The national committee on Exploring worked closely with the Exploring Division in making recommendations for this revision. Groups of experienced volunteers also assisted- especially in the revision of advancement requirements. The object was to make available to Sea Exploring some of the elements of the new Explorer program that had been found effective, while preserving the integrity of Sea Scouting with its traditions. After extensive field testing, the Exploring Division put the revised Sea Exploring program into effect. This was done in May 1966 with a new edition titled Sea Exploring Manual, written by Arthur N. Lindgren. In 1968, a new Exploring Division, BSA was organized and established under the direction of John M. Claerhout, who placed a new emphasis on Sea Exploring by naming William J. Lidderdale as the first time director of Sea Scouting since 1935. Afterwards, a new National Sea Exploring Committee was formed with Morgan F. Fitch, Jr., as Chair, to give new national volunteer emphasis to the promotion and support of Sea Exploring. In response to field reaction, the new Handbook for Skippers was written by Arthur Lindgren and published in 1971 for Skippers, mates, ship committee members, and other related adult leaders. The following year, Sea Exploring (along with all other phases of Exploring) officially became coed. In 1974, the U.S. Navy assigned a liaison officer to work in the BSA national office. A series of officers served in this capacity through 1983. Their work further enriched and expanded Sea Exploring. Sea Scouts across America were saddened by the death of Commander Thomas J. Keane in 1984. His pioneering efforts on behalf of Sea Scouting extended over sixty years. The rich tradition and long tenure of many Sea Scout Ships are a tribute to his career. Technological improvements in seamanship, extensive changes in aids to navigation, and program improvements created the need for a new Sea Exploring Manual in the early 1980’s. Long-time Sea Exploring leader, Bill Minto of Houston, Texas, did most of the text revision with the help of Don Callenius and Bob Maxfield, former national directors of Exploring, and Mike Strain of San Francisco. A number of BSA Skippers, U.S. Coast Guard personnel, and maritime experts contributed to this revision. In 1998, the Boy Scouts of America reorganized the Exploring program into the Learning for Life Exploring program and the new Venturing Division. Sea Exploring was placed in the Venturing Division and was renamed Sea Scouts. The 10th edition of the Sea Scout Manual, edited by Bruce Johnson and Jimmie Homburg, was published in 2000, which extensively revised the content and organization of the handbook, as well as updating advancement and uniforming standards. In 2002, the Sea Scout Support Committee re-initiated the national Sea Scout sailing championships. The new competition, called the William I. Koch International Sea Scout Cup, is named for William Koch, famous yachtsman and National Committee member, whose generous support has made the competition possible. The Koch Cup competition includes Sea Scout competitors from all over the United States, as well as international Sea Scout participants. The inaugural Koch Cup took pace in August of 2002 at the Columbia Yacht Club in Chicago, Illinois and had been held every other year since. The 11th edition of the Sea Scout Manual was published in 2010, which extensively revised the content and organization of the handbook, as well as updating advancement standards. Went into commission without ceremony. On June 23, 1913, Captain Wallace J. Goodwin of the Boy Scout Ship Pioneer wrote perhaps the most prolific words describing the first Century of Sea Scouts: Went into commission with out ceremony. Nothing better defines how Sea Scouts for 100 years have done the hard work and provided opportunity and hope to youth across the United States. The Sea Scout Centennial was celebrated at several local events celebrating the 4 S’s of Sea Scouts: Scouting, Seamanship, Service & Social. There were over 40 events across the United States. Sea Scouts could argent advancement with special Centennial Electives and the Gold Centennial Award for youth and adults. Sea Scouts were also greatly benefited from the family of Arthur Astor Carey, who shared the 1913 and 1914 Logbook from the BSS Pioneer. The logbook gives us a powerful look at the first Sea Scouts, their program and provides an actual date for the adoption of what would become the First Class Anchor. The States of California and Massachusetts both honored the Sea Scout Centennial with Proclamations. The Sea Scout Centennial was also featured in BoatUS and other maritime publications. Menninger in Kansas. Other Sea Scouts all across the US struck 8 Bells at 1200 to honor all of those who have dedicated their time in service to youth. Arthur Carey, with the Boy Scout Ship Pioneer in Boston, is credited with starting Sea Scouts in the United States. There were other early leaders who were instrumental in this period, including Charles T. Longstreth, who organized a Sea Scout patrol aboard his yacht Arawan in Philadelphia, Pennsylvania. In 1923, Thomas Keane was named the Acting Director of the Sea Scout Department of the Boy Scouts of America. At that time, there were 1,100 Sea Scouts in 85 Ships. Under Commander Keane’s leadership, Sea Scouts grew in program, with new manuals, and surged with new Ships forming across the country. By 1934, there 19,448 Sea Scouts in 1,041 Ships. Over 100,000 Sea Scouts served in World War II. Fleet Admiral Chester W. Nimitz stated that forty percent of the men under his command in World War II had been Scouts, who had won sixty percent of the decorations for valor. A century since we first set sail, Sea Scouts continue to sail in waters off Puerto Rico to rivers of Iowa to the warm oceans of Hawaii.